A brand known for high-quality engineering machinery and electronics, Bosch is also recognized as a leading producer of power tools and automotive components. 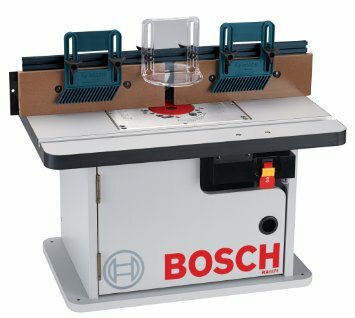 Those looking to start a backyard operation or a personal project will be delighted to find that Bosch also offers router tables for your woodworking needs. The Bosch RA1181 Benchtop Router Table is a versatile kit with a large surface that allows you to get plenty of work done easily and precisely. 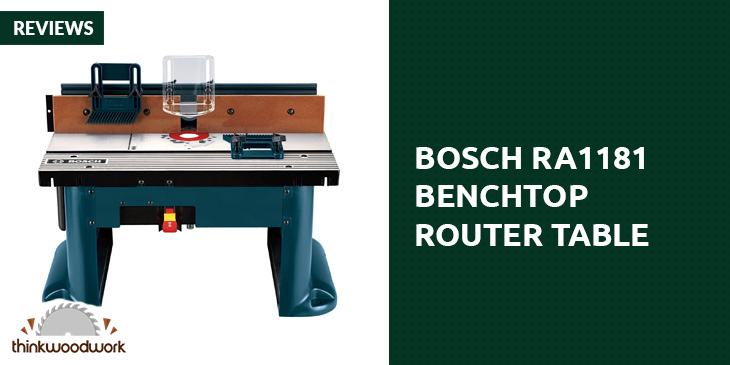 The Bosch RA1181 Benchtop Router Table has a versatile design that can fit a variety of routers for different woodworking projects. It is 27 inches wide, 14.5 inches, high, and 18 inches deep. It weighs at 30 lbs. It has a set of three mounting plate insert rings, two adjustable featherboards, and an adjustable clear guard, as well as a starter pin and guard. It has a tall aluminum fence measuring at 4 and 7/8 inches high and 25 and 1/8 inches long. The featherboards easily attach to the fence and table and are adjustable to fit depending on what you’re working on. It also has adjustable MDF plates, an aluminum router mounting plate, and two outfeed fence shims. Many buyers who reviewed this item on Amazon remarked that the Bosch RA1181 Benchtop Router Table is a setup that provides great value for money. 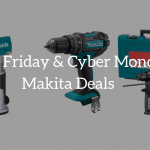 Solid built and is ideal for those starting out with their on woodworking projects or small businesses. Featherboards that come with the kit are useful and well-designed. 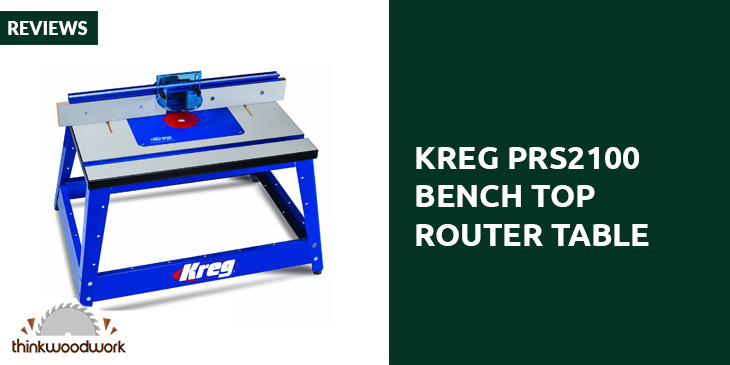 Easy to set up and it fits a variety of routers, making it ideal for all sorts of woodworking tasks. However, some customers lamented that parts of this router table leave much to be desired. Parts list that comes with the instruction wasn’t clear on how to identify the nuts and bolts that come with the kit. Power switch was a bit oddly designed. Storage area was not as roomy and couldn’t fit all the other components that are not in use. Those looking for a starter kit for all kinds of woodworking projects will find that the Bosch RA1181 Benchtop Router Table is a veritable choice. It’s reasonably priced, versatile, and easy to use. 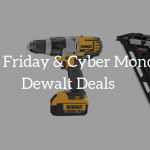 It comes with all the components you would need to make desks, cabinets, benches, and more. You can easily make your own stuff using this benchtop router table. If you have a few personal woodworking projects that you have yet to get around to work on, getting a router table will probably make things easier for you to actually do it. Whether it’s a table, cabinet, or chair, you will find that the compact and versatile Bosch RA1171 Cabinet Style Router Table will help you accomplish it conveniently. 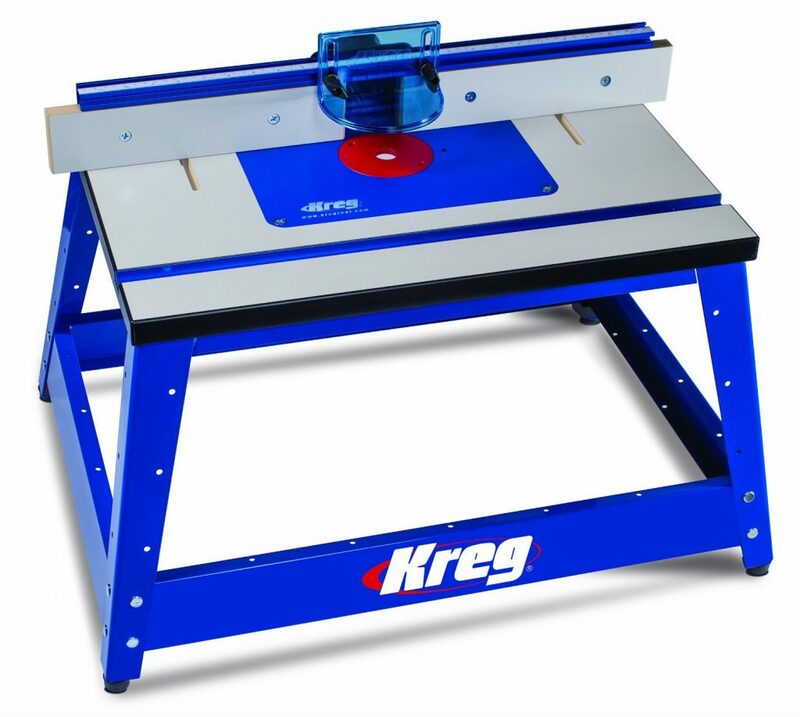 This product is designed to make cutting and routing easier for you. The cabinet-style design promises better noise reduction and improved dust collection. 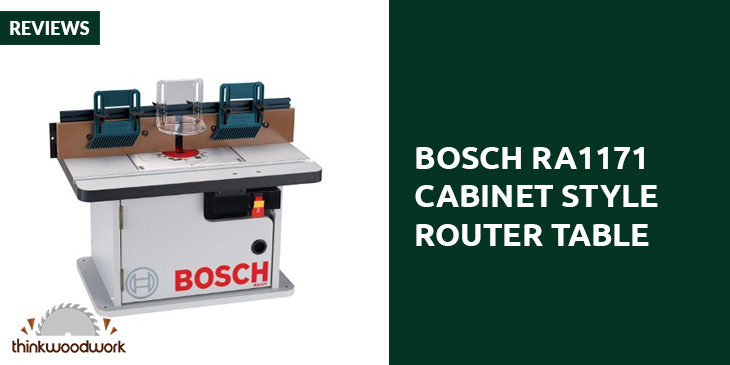 The Bosch RA1171 Cabinet Style Router Table offers adaptability and reliability in a well-built frame. It comes with a set of three mounting plate insert rings, a tall aluminum fence measuring 4 7/8 and 25 1/8 inches, and adjustable MDF plates for easy operation and sturdy support. The two adjustable featherboards can be adjusted to make it easier to work with different kinds of pieces. The table measures 25.5 inches wide, 14.5 inches tall, and 15 7/8 inches deep. It weighs 42 lbs. The fence can be opened up to 3 3/16 inches, and the maximum throat opening is 3 5/8 inches. Because of its cabinet design, the Bosch RA1171 Cabinet Style Router Table has two dust collection ports that can handle all the dust and debris from working. Both of these can fit standard 2/5-inch vacuum hoses. The table also comes with an adjustable clear guard, a starter pin and guard, and two 1 1/6-inch outfeed fence shims. 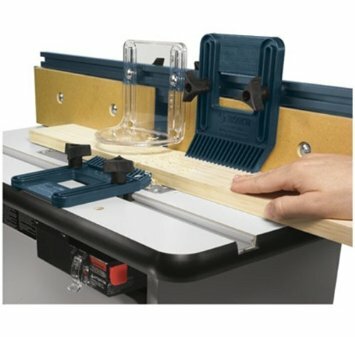 Great value for money for such a compact and versatile router table. Has a sturdy built and works great with all kinds of wood pieces. Convenient and small enough to be easily stowed away when not in use. However, there are customers commented on the complexity of assembly of the Bosch RA1171 Cabinet Style Router Table. Even those who claim that they are very handy had difficulty putting this router table together. Some also lamented that it’s very heavy. Also, they mentioned that the dust collection ports are not very efficient, especially the bottom one, which ends up rendering the storage area below the table useless. 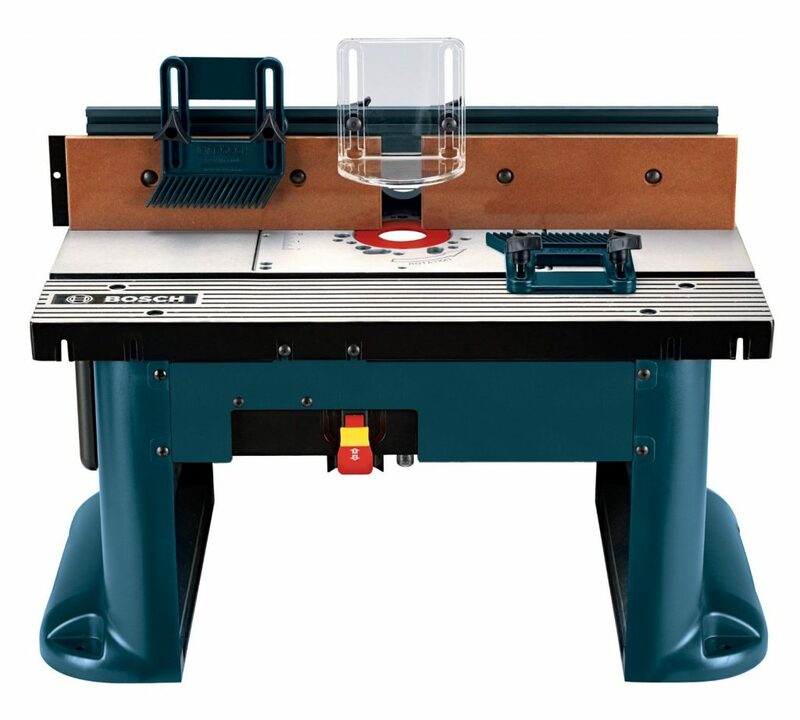 Those with some personal projects going on or even those looking to start their own backyard operation may consider the Bosch RA1171 Cabinet Style Router Table to be a good start to their woodworking journey. It can handle a lot of different wood pieces for any of your projects. It’s flexible, sturdy, and easy to store. It’s also well-built and can last you a long time, and for the reasonable price tag, the purchase will definitely be worth it.